Leave ordinary hotels behind, and enjoy luxury lodging at Abigail’s Bed and Breakfast Inn during your visit to Southern Oregon. Offering lovely period-appointed en-suite guest rooms, our accommodations have been luxuriously furnished with your comfort in mind. A scrumptious two-course “made-from-scratch” breakfast is served each morning of your stay, and complimentary beverages and snacks are available 24 hrs/day. 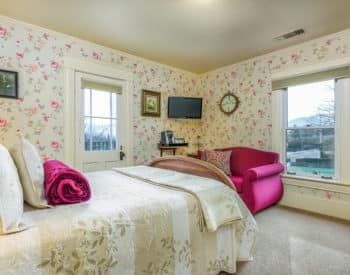 Our B&B is an environmentally friendly inn and as such we provide a daily “tidy.” Visit our Photo Gallery to get an inside look at Abigail’s Bed and Breakfast Inn.